Learn about the different types of Analytics data that are available, and how to use it to improve your referral program and product. The Referral SaaSquatch platform provides access to a wide range of information about your referral program and its participants. Most of this information is easily accessible through the Referral SaaSquatch portal’s Analytics page. By understanding what the data means, and leveraging the insights, you can find opportunities to improve your referral program performance. The referral program overview section provides a look at the Referrer and Referred User Funnels within your referral program lifecycle. Unique Visitors - How many people were exposed to your referral program through the referral widget in your platform. Active Referrers - How many of those people shared out their referral. Successful Referrers - How many were successful at getting a referred user to complete their end of the referral process. What does this data tell me? The Unique Visitors information provides a look at how many people were exposed to your referral program through the referral widget in your platform. This information can help identify where to increase the visibility of your referral program in your product. Increasing the visibility of your referral program in your product can expose the offer to more of your existing customers, leading to more referrals being shared out. Secondly, the Referrer Funnel provides valuable information about the filtering between each of the referrer’s steps in the referral flow. Varying success in the each of the stages of the funnel can help you understand which are doing well, and which you would like to focus on for improvement. What you might find is that your referral program is seeing lots of exposure (Unique Visitors), and many people are sharing out the referral offer with their friends (Active Referrers), but that you would like to increase the number of people who are successful at enticing a referred user to convert (Successful Referrers). Finally, the Referral Success Rate value at the top of the Referrer Funnel lets you know what percentage of your existing users, who were exposed to your referral program, managed to successfully complete a referral. This metric can be used as part of a high-level look at the overall health of your referral program. Referred Visitors - People who clicked on a share link. Referred Users - Referred Visitors who ended up signing up for an account in your system. Referred Conversions - Referred Users who ended up paying for your product. The first key piece of information in the Referred User Funnel is the number of Referred Visitors, or how many people clicked on a referral link and were redirected to your product. 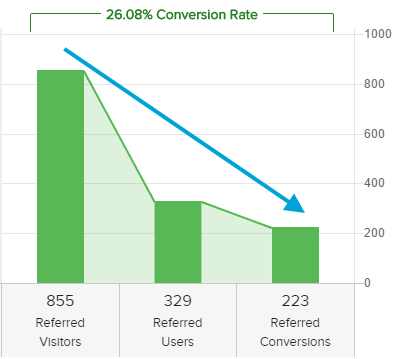 The second important value to look at is the Conversion Rate percentage at the top of this section of the funnel. This value represents what percentage of people made if from clicking a referral link, all the way through to paying for your product. These two metrics together provide a good look at the health of your referral program. With so many differences between businesses there is no one value for the Conversion Rate which indicates a healthy referral program. The most pragmatic approach to utilizing the numbers from your Conversion Rate is to look at how it changes over time. As you continue to run your referral program you should expect referrers to bring in more higher quality leads. These referred user will in turn begin to make their own referrals. Both of these activities will compound over time and increase that Conversion Rate as you continue to run your referral program. Very low or very high conversion rates may indicated a reward that is not well positioned, and either not compelling or too compelling to prospective customers, or other issues with the path to purchase for incoming customers. If you are finding that your Conversion Rate is very good, but you would like to increase the overall number of conversions you are seeing, then it may be a case of simply needing to entice more referrers to share the referral offer among their friends. This will drive traffic (Referred Visitors) at the top of the Referred User Funnel, which will filter down to more conversions. You might be finding that many people are driving a good amount of traffic to your site through your referral program (Referred Visitors), but would like to increase the number who are signing up and then paying (Conversion Rate). Making sure the messaging being shown to Referred Visitors enticing them to take advantage of the referral discount is clear. Ensuring that the reward being offered is persuasive enough for people to want to take advantage of it. The Referral SaaSquatch Analytics Portal provides a range of additional information about each of the Referral Funnel steps within the Program Overview section. Each of these additional sections is filtered by the highlighted Referral Funnel step. E.g. 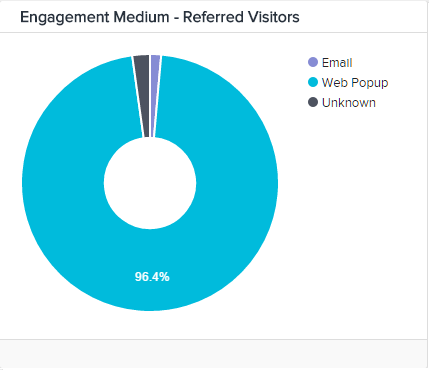 When the Referred Visitors Funnel step is selected in the Program Overview section, the Engagement Medium graph is showing what Engagement Medium users who referred these Referred Visitors used to access the referral program (e.g. popup, embedded, email, mobile). The Engagement Medium program metric tracks the medium your existing users interacted with to share out their referral. Some of the mediums which your referral participants might access your referral program from include: mobile, popup, and embedded versions of the widget, and email links. This statistic can be extremely helpful if you have your referral program visible in multiple areas of your product as it can help you identify what method of accessing your referral program is the most successful. You might find that people are much more likely to share out a referral from the widget within your mobile app than within your web app. This information can shed light on the user experience of your referral program in your web app vs. your mobile app and can help indicate differences in user experience across platforms. This can be useful when looking for user experience areas to improve in your product. Comparing the Engagement Medium metrics between the Active Referrers and Successful Referrers Program Overview sections can tell you what percentage of referrers shared a referral from an email, and what percentage of all your successful referrers were the result of sharing from an email. This might show you that your referral program is seeing a lot more shares made from within your product vs. links in transactional emails. If a good portion of your referrals come from these emails, this information might help decide to feature your referral program share links more prominently in transactional emails to increase exposure and drive traffic through this successful medium. The Share Medium program metric tracks the network or channel that a referral was made through. The medium your existing users use to share out their referral might include Facebook, Twitter, email, and direct (copy link). By comparing the Share Medium percentages across different stages in the full Referral Funnel you can see how successful each medium is at driving traffic as well as converting referrals. 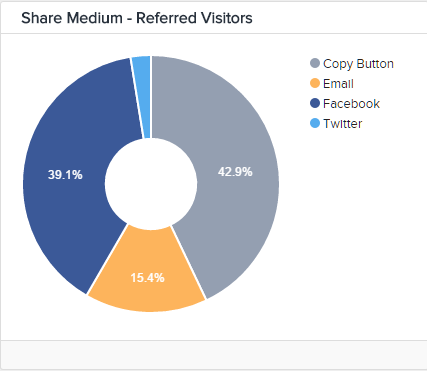 A comparison between the Active Referrer and Successful Referrer’s Share Medium values can tell you a lot about which share medium (Facebook, Twitter, email, copy) drives more overall shares vs. which drives more conversions. While many referrers might have chosen to share their unique sharelink on Facebook, you might find that people who shared their referral using the copy & paste method are more successful on average at getting someone they referred to become a paying customer. This information can help you decide which share medium to place more prominently in your widget, email, or prioritized when allocating resources to expanding your businesses presence of a specific social media platform. Comparing the stages of the Referred User Funnel (Referred Visitor, Referred Users, and Referred Conversions) provides insight into the activities of people who were referred to your product. An example of what you may find is that Facebook will drive more overall traffic to your website based on the sheer number of people sharing out links for people to click on (Referred Visitors). Knowing which Share Medium is the best for driving traffic to your website can be helpful if you are trying to figure out how to increase overall traffic. In turn, you may find that although more people visit your site from Facebook links, it is ultimately people who signup through a referral that was shared through email who are most likely to ultimately pay for your service. If this is the part of your program you would like to improve then you will know to increase the visibility of your email share options. Many business operate in a wide range of geographical regions and market. Understanding your referral program participation and success across these regions can be crucial to knowing what region to target resources to. The Referral SaaSquatch platform is able to provide you with detailed geographical information about referral program participation from end-to-end in the referral flow Funnel. One example use for the geographical data your referral program provides is to compare the success of your referral program across multiple markets that you operate in. This information can help you identify how well each of your regions is doing relative to each other. If one is doing better or worse you will know which to target for promoting your referral program. Once you have launched a campaign you are also able to track its success divided by region by filtering based on date to see only changes that have happened since the campaign started. How do I use this Analytics Information? The information in this article is intended to help you make sense of the wide range of information that is available about your referral program. Once you have an understanding of what your referral program’s data is telling you, you can use it to help make improvements and optimizations to your program. Our article on Referral Marketing Channels will help you better understand the different ways that your users can interact with your referral program. You can also read more about the different options user have for sharing out their referral in our article on Customizing Your Referral Program.